A Boston native, Ric Murphy is an educator, historian, lecturer, philanthropist, political analyst and award-winning author who takes a keen interest in writing about the rich and tremendous contributions of African American men and women in American history. Through his scholarly works, he shares the rich tapestry of American history by weaving together the personal and heroic stories of amazing men and women, set in the backdrop of both domestic and international events. Ric is continuing to work on a five-part series of historic stories about interesting and unrecognized African Americans who have made valuable contributions to United States history. “Each time the Free People of Color evolved and improved their conditions, new laws were constructed to hold them back and restrict their success.” Ric Murphy’s history of Joan Cornwall and Bob Murphy in Freedom Road is a fascinating journey through America and our treatment of people of mixed race throughout the years. During the Revolutionary War, black men fought next to white men with no segregation at all. I was astounded that, after Lincoln’s Emancipation Proclamation, President Jefferson Davis issued an “Enslavement Proclamation” that took the freedom of all Free People of Color in the Confederacy and made them slaves. This is just one of the interesting facts that I learned about this amazing family. Each generation of this African American family served this country and excelled in business and education. They really were one of the founding families in the United States of America. Freedom Road by Ric Murphy is not just a story of one African American family, but encompasses all African Americans and people of mixed descent. This genealogical history is well documented and begins with the Jamestown colony in the 1600s. There is so much new information in here that I certainly never learned in American History class. I became immersed in Mr. Murphy’s family and had a hard time putting this book down. I also am a genealogy person and I have traced my husband’s family back to King John, and I was surprised how many surnames Mr. Murphy and my husband have in common. He has lots of Cornwalls and Halls in his history and they also lived in some of the same areas of America. I’m sure they must have come into contact with each other over the years. 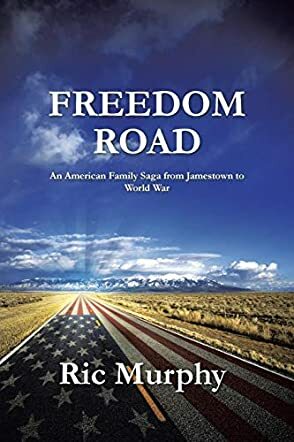 I recommend Freedom Road by Ric Murphy to anyone with a love of American history and genealogy. Mr. Murphy shows us what can be done with our family trees. This is one fantastic read.